I know you are probably sick of seeing pumpkin recipes BUT you MUST check out these pumpkin brownies if you are a brownie lover. I promise this will be the last pumpkin recipe for the season as we move over to festive treats, meals and side-dishes for the holidays. It’s no secret that I am passionate about brownies since I talk about them often since I created my signature fudgy brownie back in 2012. The best part about these pumpkin brownies though is that if I didn’t add pumpkin spices then you would have no idea about the pumpkin puree. This is a great way to sneak in some pumpkin nutrition to your diet. A bit of healthy works for me in a dessert of any kind. Since I’ve played with pumpkin in the kitchen these past few weeks I had some pumpkin puree left in the refrigerator that I didn’t want to waste. I was thinking about what I wanted to make and I remembered a CBB fan telling me that she makes zucchini brownies. From that moment these pumpkin brownies were created. I wanted my pumpkin brownies to have the same texture and density as my fudgy brownies because I like a nice thick, heavy brownie with fudge icing on top. These pumpkin brownies will remind you of pumpkin pie in one bite and chocolate brownie in another. I must admit that I was afraid that the pumpkin would make the brownies too moist but they turned out perfect. They are moist but they keep that fudgy, thick texture that I crave when I eat brownies. I’m not a fan of cake brownies as they taste like chocolate cake to me, not brownies. Since I’ve already mastered what I believe is the perfect fudgy brownie I worked from that recipe to create these pumpkin brownies apart from the icing. I’ve also made lemon-lime cheesecake brownies and chocolate chip cookie dough brownies both of which are dense and delicious. I considered adding the pumpkin spice puree mixture in the middle of the brownie so there was a layer of it but decided at the last-minute just to stir it all in. I’m glad I did as these pumpkin brownies remind me of exactly what I was hoping for, pumpkin pie. Unfortunately, I didn’t have enough butter out to make chocolate fudge icing but I did have two cans of chocolate condensed milk in the cupboard. I looked online to see if I could turn this chocolate condensed milk into a quick chocolate frosting and sure enough it’s simple to make condensed milk icing. If I wanted a glossy glaze for the pumpkin brownies all I would have done was heat up the condensed milk and then add a bit of water, stir and pour over the brownies similar to a ganache. 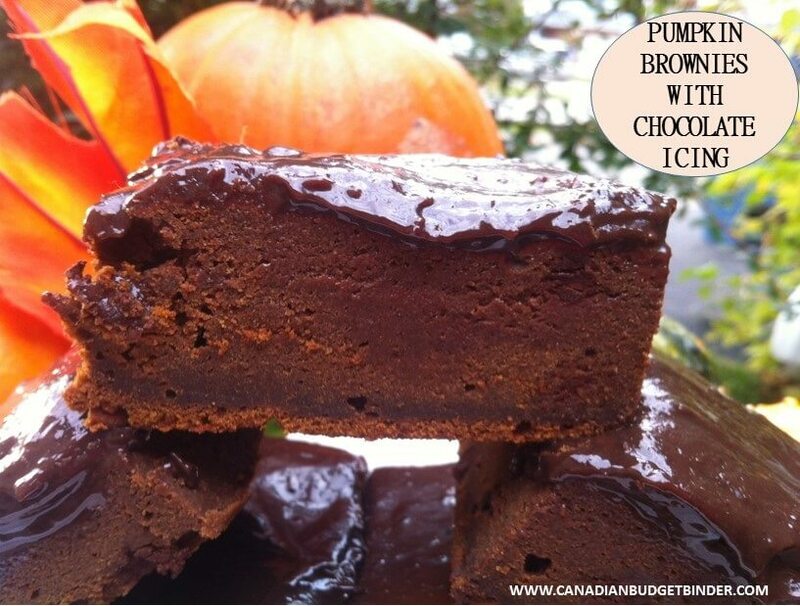 I didn’t want that because I prefer a thicker chocolate icing on my pumpkin brownie. To make a thicker condensed milk icing all once you add the water to the chocolate condensed milk after heating it up stir and then let it sit for a bit. Amazingly it thickens up and tastes delicious. It won’t rock your socks like a chocolate fudge buttercream icing would but it’s light and simple and works perfectly fine as topping for any bars and cakes. Overall, our neighbours gave these pumpkin brownies an A++ which I was thrilled about. Oddly enough we are always passing our recipes back and forth so we can test them out. Enough talk, let’s get to these delicious pumpkin brownies. 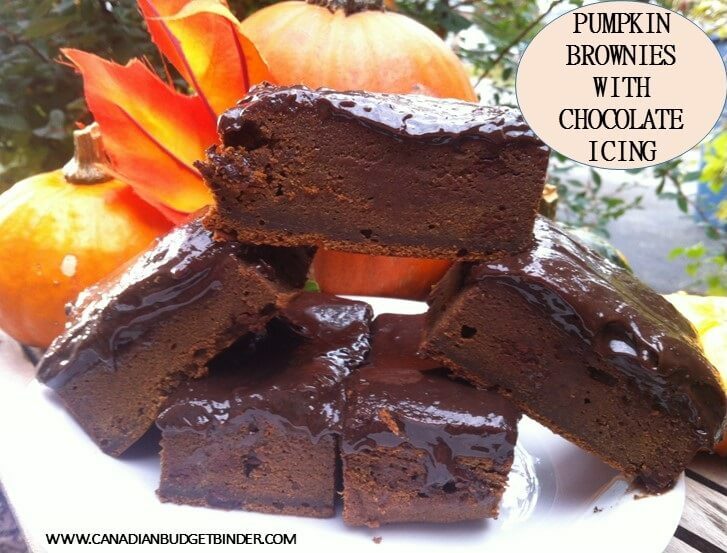 If you love brownies like I do you will want to try these fudgy dense pumpkin brownies with a lovely condensed milk icing on top. They are easy to make and easy to eat. Enjoy. In another bowl sift the dry ingredients, flour, salt, baking powder and cocoa powder. Add the pumpkin puree mixture to the butter mixture and combine then slowly add in the flour until it's combined. Don't over-mix. In a pot add the condensed milk and warm it up until it bubbles, remove from the stove and add 1 tablespoon of cold water and vanilla extract. Stir completely and set aside to thicken or use now a thin glaze. That’s all for pumpkin recipes in 2015 so if you’ve read this far down the post that means you are considering making these pumpkin brownies. You should, they won’t disappoint you one bit. Yum, yum, yum!! I still think it looks more like fudge but it does look yummy!!! Looking forward to the Holiday recipes!! Have to get started rounding up ingredients for mine shortly, first up will be my dark fruit cake. Nope, trust me it is NOTHING like fudge. It is a dense but moist brownie.. and it is so good! I still have half left in the freezer lol.